Although many lesbian, gay and bisexual (LGB) adults feel that most major faiths are unwelcoming to their community, a majority of LGB adults are religiously affiliated, according to a new Pew Research Center study. But they are much less likely to be Christian than the general public and are more drawn to smaller, non-Christian denominations. About 5% of the 2014 Religious Landscape Study’s 35,000-plus respondents identified themselves as members of the LGB population. Of that group, 59% said they are religiously affiliated. 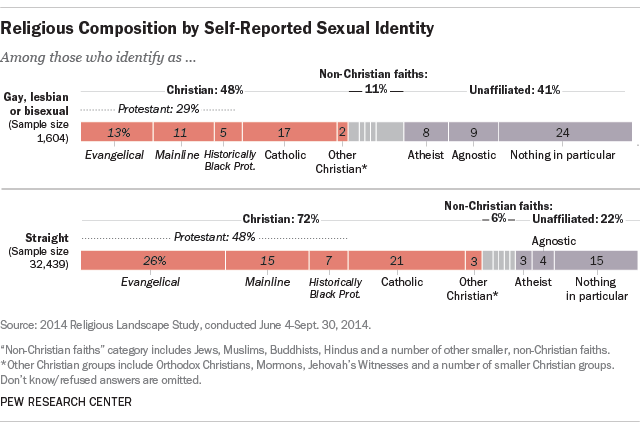 But only 48% of them reported belonging to a Christian faith group, compared with 71% of the general public. In another contrast, while only 6% of the general public affiliates with a non-Christian faith, almost twice as many (11%) gay, lesbian and bisexual adults do so. And almost half of these gay, lesbian and bisexual adults (or 5% of adults overall) said they belong to one of the smaller faith groups, including Unitarian Universalist and other liberal faith traditions (2.9%) and New Age groups (2.4%), such as Wiccans and pagans. The Jewish and Buddhist faiths also attracted small percentages (2% each) of LGB adults. LGB adults also differ from the general public in that they are much more likely to be unaffiliated (41%), almost twice the rate of Americans overall (22.8%), the study found. In 2013, Pew Research Center surveyed the attitudes of LGBT Americans, including their views of religion. Even though the LGBT survey uses a somewhat different methodology and includes a small number of transgender Americans (the current study did not include a question about transgender identity), some of its data on religion adds interesting context to the affiliation data on gays, lesbians and bisexuals contained in the 2014 Religious Landscape Study. For instance, the 2013 survey found that many LGBT adults regard major faith groups as “unfriendly” to their community. Large majorities said that they perceived Islam and the Mormon Church (84% and 83% respectively) as unfriendly to LGBT people. Likewise, 79% saw the Catholic Church as unfriendly, and 73% said the same of evangelical churches. In addition, the 2013 survey found that roughly three-in-ten LGBT adults (29%) said they personally were made to feel unwelcome in a religious organization.